Increasing traffic to a website with effective podcast will also increase online brand awareness as well as generate authority to a company and the product or services it offers to consumers. Learn 5 ways of increasing traffic to your site with successful podcasts. Podcasts, albeit an older form of media, have witnessed a resurgence in popularity within the last few years. Podcasts allow people to absorb information or entertainment at a pace with which they feel comfortable with. With their ability to be downloaded quickly and replayed on devices with ease, podcasts can also do wonders for your successful digital marketing strategy, building a dedicated audience while driving traffic to your website. The origination of podcasting can be traced back to 2004 when Ben Hammersley coined the term in an article published by the United Kingdom’s Guardian newspaper. Podcasts were initially named after the iPod but today, podcasts can be listened to anywhere, on any media playing device. Podcasts are a great media resource for companies wanting to market their product or service, but how exactly do podcasts help drive traffic to your website? It's imperative to utilize research along with data gathered from web analytics reporting to find out where your users are spending most of their time and leveraging that information within your podcasts to engage with existing users as well as attract new users. Video marketing is successful in generating interest and driving traffic to your website, however, podcasts can be just as effective as an alternative. Many companies would like to take advantage of the multimedia marketing opportunities but are hesitant due to the amount of time it requires and the amount of money for resources needed for video production. Podcasts are a great alternative that give you the ability to create an audience, deliver engaging information about your goods and services. All without the need for face time and heavy production costs and schedules. Advertising a podcast on the homepage of your company site is just one way of generating interest. Be persistent and generate quality content and a podcast can really take off. It may take some time to really be able to measure results as growing an audience takes time, but podcasting, when done successfully, will in time generate an increase in traffic to your site, therefore improving your rankings while building trust with your consumers. Podcasts offer expert information or advice which in turn generates brand awareness and trust between the business and its consumers. When choosing to use podcasting for marketing purposes, it should be a incorporated into your SEO marketing strategy as well as your social media marketing and your content marketing strategies. A successful digital marketing campaign will demand that all marketing avenues intersect and support each other. The way a podcast works on most media hosting sites is that users subscribe to listen to regularly scheduled podcasts. With every subscriber, you gain valuable information on your audience and potential consumers that you can leverage for future podcast topics. Your podcast audience have the opportunity to share the podcast by word of mouth or on social media with friends and family. This is why the quality of your content is so important. Quality content attracts new listeners as well as keep the repeating ones returning. Podcasts also offer an opportunity for a business to show authority in their respective industry. They can open forums to distribute knowledge or advice. For example, say you sell, install and refinish wood flooring. That's quite the specialized market, but, there is a specific audience out there for selling, installing and refinishing wood flooring. They are homeowners, contractors, landlords and home improvement enthusiasts that hunger for ideas, advice, and information that you can provide, all the while piquing their interest to invest in your services. Capture your audience by showing authority in your industry. Utilize your company's expertise with popular topics that are directly or indirectly tied the goods or services you provide. Ask yourself? What would my listeners be most interested in? What unique lesson can I teach them? When you have informative and authoritative, quality content, you generate a dedicated audience. An audience that will trust your company's reputation therefore feel good about investing in your product or service. It's important to develop a relationship with your listeners to the point where they trust in your knowledge and believe in your message. Being creative and consistent with the podcasts will also help drive traffic to your site as well as contribute to your online brand awareness. By inviting knowledgeable guests with stories and advice to share with your audience, you will increase interest. While attempting to stay on topic as much as possible, sometimes it’s a good idea to change the pace and bring someone in on the podcast to keep ideas fresh. It’s okay, it keeps your subscribers questioning in anticipation while waiting for the next podcast. When you put in the time and effort to build an engaging and informative podcast, it’s almost a guaranteed way to boost traffic to your site. There are not many ways you can distribute authoritative information while still being relevant and engaging within a sustainable amount of time. Again, being consistent and distributing quality content is key to successful podcasting. Being persistent and creative will pay off. Utilizing social media channels such as Twitter, Facebook, and Instagram to present previews of upcoming episodes is just one way to promote your podcasts. Equipment needed to launch a podcast successfully is relatively cheap compared to other forms of content creation. However, with the right amount of effort and dedication podcasting can take your business to new heights. Google is all about informative, relevant and substantiated content. When you plug a quality podcast into your website, it will help boost your SEO rankings and the quality score of your site which helps drive more traffic to your site. Search engines have become increasingly efficient at spotting quality content when it’s published. Your podcast is no different and it counts towards the overall impression Google and other search engines attribute to your company and it's website. Podcasts can also be distributed successfully within your email marketing campaigns. This is a highly effective way of drawing visitors to your site. 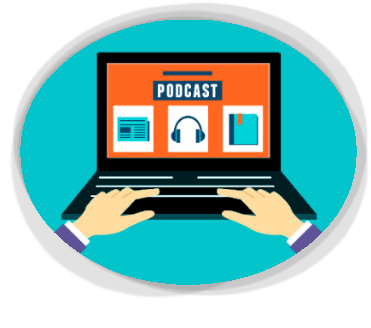 In addition to your subscribers receiving promotional materials, they can also receive podcasts within the emails. This tactic will pique their interest in visiting your site find out more information or invest in your product or service. If your listeners find the podcast engaging and informative enough, they are more inclined to share with people creating an even bigger audience for your podcasts and product or service. There is a reason why email marketing is essential to any digital marketing strategy. It’s still an effective way to reasonably and cost-effectively reach many people effectively at any time. You are inviting people to trust your authority in your company industry. You are invested in their needs, and value them as a customer.